A new corporate accountability platform launched in the United States aims to hold companies accountable by inviting shareholders and consumers to vote on how companies should address issues of the public interest. As its inaugural issue, the platform takes aim at high drug prices. 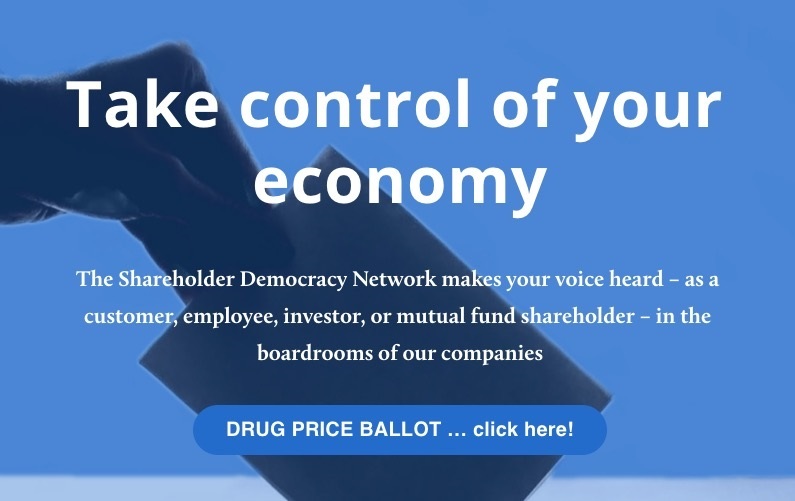 The new platform, Shareholder Democracy Network, is based on a proxy resolution process that enables not only shareholders, but consumers and members of the public, to vote on how companies should address certain issues, and for these resulting votes to be presented in company boardrooms and to the general public. The network held a press conference on 12 February to discuss the launch, why this platform is needed, and how it will work. As its first issue, the network is addressing high drug prices at six pharmaceutical companies: AbbVie, Biogen, Bristol Myers Squibb, Eli Lilly, Johnson & Johnson, and Pfizer, according to a press release. Shareholders and consumers can vote on the drug pricing ballot here. “[M]ost mutual fund shareholders have no clue what is in their holdings and, if they do, have no way to leverage that indirect ownership. And very few direct shareholders have the time and resources to wade through murky shareholder proxy materials. As a result, Big Pharma CEOs and boards have raised drug prices with little fear of a backlash that they will ever hear about,” David Apgar, founder of the Shareholder Democracy Network, said in the release. “We want all stakeholders to have a voice, not just the handful of investors who still own shares directly,” he said. Image Credits: Shareholder Democracy Network.